Learn eight breathing exercises that Dr. Weil has prescribed to hundreds of his patients. List the health benefits of breathwork. Explain how overstimulation of the sympathetic nervous system contributes to health issues. Describe the relationship between breath and spirituality. Apply breathwork techniques to increase alertness and relaxation. Practice guided exercises for restored wellness over time. The health you enjoy today, and for the rest of your life, begins with your next breath. In fact, breathing is so crucial to your body's ability to heal and sustain itself that Dr. Andrew Weil says, "If I had to limit my advice on healthier living to just one tip, it would be simply to learn how to breathe correctly." 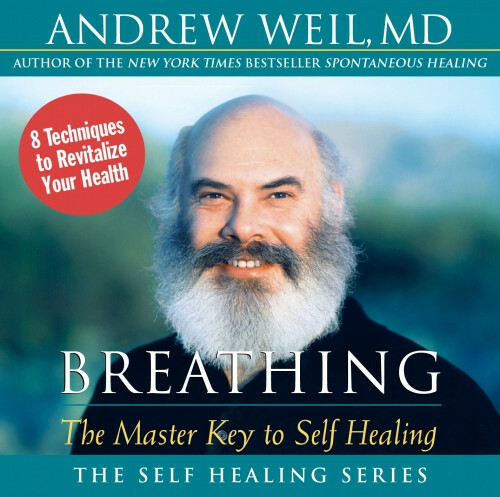 On Breathing: The Master Key to Self-Healing, listeners will learn a complete course of eight breathing exercises that Dr. Weil uses in his own life, and has prescribed to hundreds of patients over the past two decades. Dr. Weil reports that these breathing exercises get more favorable response from patients than anything else he teaches. To learn the art of healthy breathing, Dr. Weil turned to Eastern traditions, including yoga, which view the breath as a vital link to the prana, or energy of the universe. In easy-to-follow language, he explains the secret of breathwork's power over your health, and its remarkable ability to influence — and even reprogram — the nervous system. From increasing energy to lowering blood pressure, to improving circulation to beating anxiety disorders without drugs, Breathing is a practical introduction to the benefits of breathwork, presented by the bestselling author and physician who has taken the miracle out of self-healing, and made it available to all. OVERPRICED. I wanted to add a review of this product just in terms of how MUCH value there is to the content presented here. It's not that I didn't like it, it's just that if you've done any type of meditation or breahwork, there might now be anything new for you here. I was hoping for more unique exercises. I feel like I could probably find everything I paid $13 for online someplace for free. Simply put, focusing on the exhale, squeezing more air out of the lungs, making your breath deeper, slower, quieter and more regular aren't exercises -- they are techniques. This program could've been a blog post with bullet points. Plus relaxing music isn't something I would've paid for.